Welcome to our latest round-up of food news. Expect delicious things in Cornwall this month, with local asparagus and strawberries already featuring heavily on menus. Spring veg, glorious seafood and wood-fired feasts are the flavours of the month. Scroll down for our diary dates, now in chronological order to make it easier for you to find out what’s going on. Happy reading, and happy eating! Congratulations to head chef Joe Simmonds and team at The Beach at Bude, whose restaurant has just been awarded two AA rosettes for the first time. 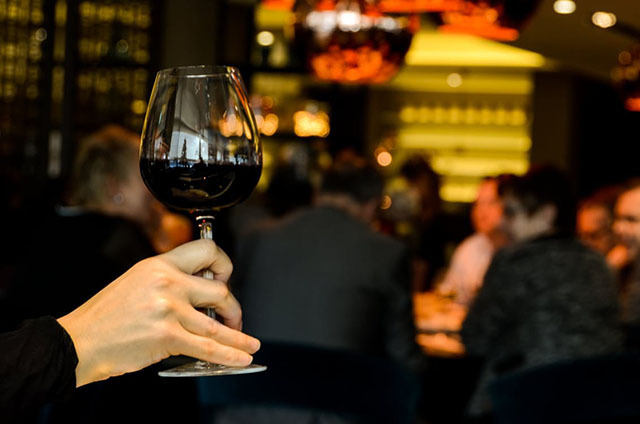 To celebrate, the hotel is holding their inagural wine tasting dinner on Thursday 4 May. The five course menu includes tandoori cured salmon with coriander mayonnaise; pan-seared scallops with lemon chicken wings; herb-crusted lamb loin; and blueberry and citrus cake. Each dish has been expertly paired with a delicious wine. £45 per person, including a glass of wine with each course. Call 01288 389800 to book. The hotel restaurant also offers a fantastically good value set lunch menu each day, with stunning sea views. 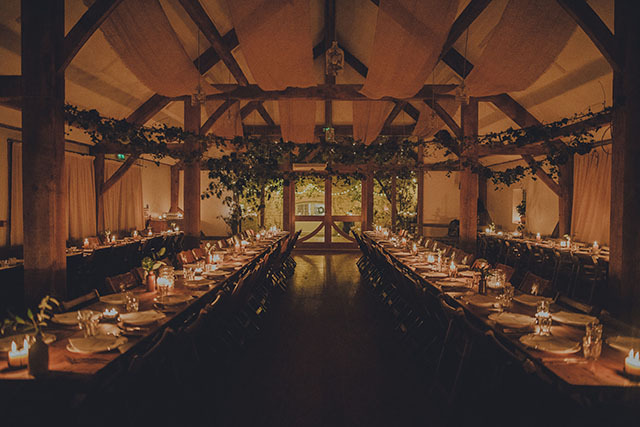 There are just a handful of tickets for the next feast at Nancarrow Farm, near Truro, on Wednesday 10 May. The menu is still to be confirmed, but will feature the farm’s own organic Tamworth pork. These evenings are always hugely atmospheric and enjoyable; the farm is absolutely beautiful; and the food is top notch. Guests are invited to arrive from 6.15pm for a welcome drink, and a wander around the farm to meet the animals, or simply to enjoy cocktails and canapés with friends in the gorgeous courtyard. Dinner, bed and breakfast options are also available. Phone 01872 540343 if you’d like to stay the night or if you’d like to make a group booking. The feast is priced at £35 per person, buy tickets online. 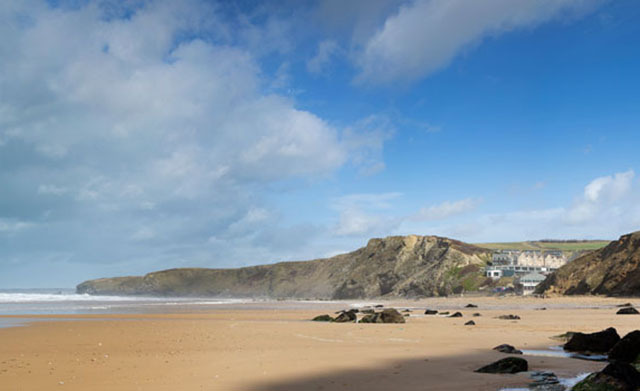 To celebrate 11 years of Jamie Oliver’s Fifteen Cornwall at Watergate Bay, the hotel and restaurant have created a fantastic two night foodie getaway on 17 and 18 May. On the first night guests will enjoy a three course meal in Zacry’s, the hotel’s excellent restaurant. 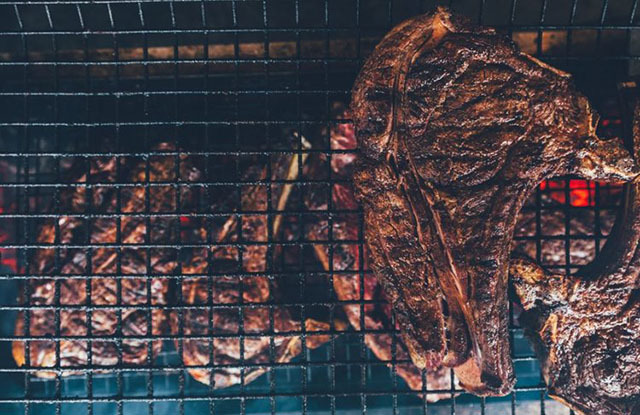 Expect big, bold, chargrilled flavours and an extensive wine list. There is an option to take part in a pre-dinner cocktail masterclass, led by a gin expert from Southwestern Distillery, at the bar in Fifteen (£25pp). 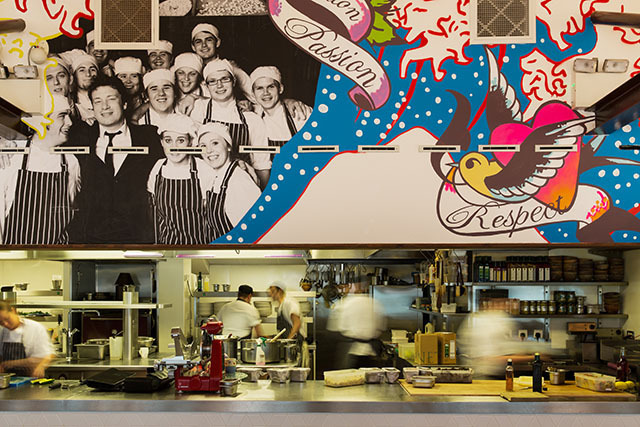 On 18 May, spend the evening with Fifteen Cornwall for their birthday. The seven-course sharing feast will showcase new head chef Adam Banks’s contemporary Italian menu. Adam will be demonstrating the pasta course with a masterclass from the open plan kitchen. Prices from £238 per person. Book online. Nancarrow Farm’s Farm Gate Feasts will be hosted in partnership with other members of the farming community and aim to raise the profile of local producers. The first Farm Gate Feast will be held with John and Jenny Keeler at Tregassow Farm, near Trispen. At the peak of asparagus season, guests can expect to enjoy heaps of super-fresh Cornish asparagus alongside Nancarrow lamb. £38 per person, book online. NB this event will be held at Tregassow Farm, not Nancarrow Farm. There are more fabulous feasts planned for the summer. Sign up to be the first to hear when tickets become available. 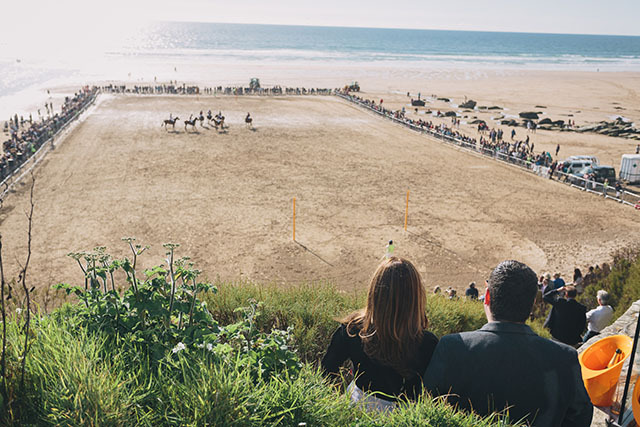 This year’s tenth anniversary Aspall Polo on the Beach takes place at Watergate Bay over the weekend of 19 to 21 May. Expect a weekend packed with entertainment, including polo matches, jousting, a dog show, street food stalls and bars, and a Saturday night beach party. Entry is free, for full details visit the website. As part of the event there will be a night of live music, fireworks and fantastic food with an authentic asado BBQ. Classic cuts of beef and lamb will be cooked in Argentine style at the hay bale restaurant on the beach. Guests will enjoy a glass of champagne on arrival, and can chat with the polo players and chefs. Jugs of Aspall cyder and apple juice accompany the lamb course, followed by BBQ demos, a feast of meat for the main course, live music, dessert, a cocktail and fireworks. For full details see here. The three course meal kicks off at 7.30pm on Friday 19 May. £60pp. Tickets are available online. Get those fingers ready… Tickets for The Hidden Hut’s May feasts go on sale at 12 noon on Monday 1 May, with feasts on 11, 20 and 29 May. If you’re lucky enough to be attending any of these fantastic events, then why not make a night of it? Book a room at the extremely comfortable Rosevine Hotel, just a five minute walk away. They have various rooms, suites and apartments, plus an indoor pool. 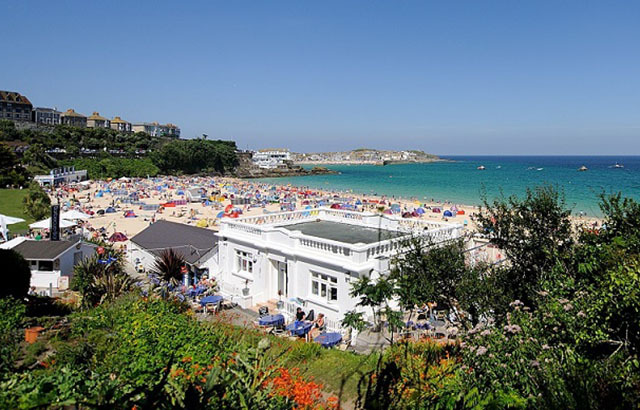 The Headland Hotel in Newquay is offering Prosecco Lunches in The Terrace Restaurant. From 2 May to 14 July, Monday to Thursday, enjoy two or three courses of delicious, locally-sourced food with a chilled glass of fizz, whilst enjoying the panoramic sea views. Two courses for £19; three for £24. Booking is advised – phone 01637 872211. 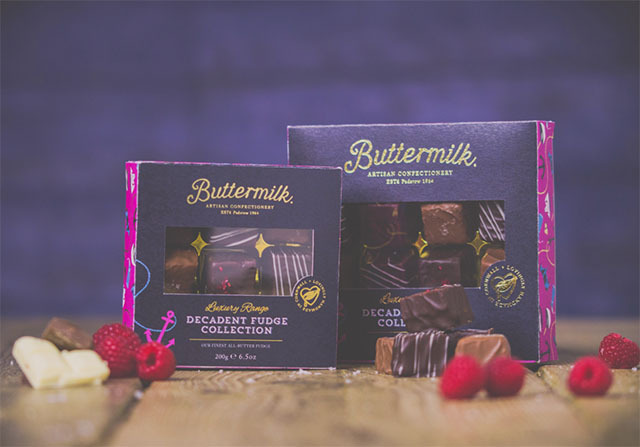 New to the Buttermilk range are the Decadent gift boxes, which contain three flavours of all-butter fudge, coated in chocolate: Caramel Sea Salt, Very Berry and Triple Chocolate. Available in large (£9.99) and small (£6.99), with an optional birthday “wrap” to turn the large gift box into a birthday card. The annual Wadebridge Foodbank fundraiser is taking place 6 May at the Royal Cornwall Events Centre. This year sees a great collaboration between the foodbank, and fabulous new social enterprise caterer, Keep Cornwall Fed. A meeting of minds in the truest of senses, they will be producing a Best of Cornish menu for the event using local, seasonal ingredients, whilst donating a meal to someone in food poverty for every ticket sold. Other highlights include live entertainment from The Grace Notes, and a grand prize raffle and auction on the night. Tickets are £35 per head, to include a three course meal and drink on arrival. Available from Wadebridge Foodbank and Wadebridge Wines. 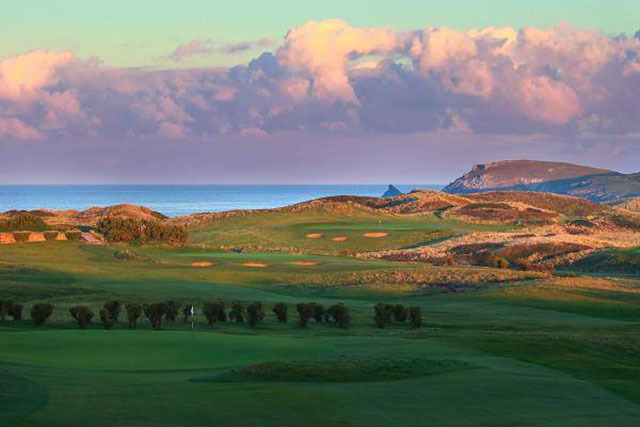 The restaurant at Trevose Golf Club is worth a visit, in particular for their Sunday roasts, with a stunning view over the golf course down to Constantine Bay. Later in May the outdoor pool will re-open, and children can swim for free when booked in for Sunday lunch. Sunday Roast Trio (sharing board) is £16, 2 courses are £18, and 3 courses are £21.50. Why not make the most of your visit and take advantage of the Family Sunday Golf offer? A round on the fun par 3 course, and two course lunch, is priced at £22 for adults and £15 for children. To book, phone 01841 520208. A new venture from fish-fanatic Mike Warner, these bespoke tours are designed to give chefs and media professionals (and others who are interested in fishing) a more detailed understanding of the industry. In Newlyn, you will get the chance to meet fishermen and others involved in the catching and processing sector, at all levels, and tours are designed around the client’s needs, although a base itinerary underpins what is usually spread over two days. Cost is based on £350/day excluding travel and accommodation and as all tours are bespoke, Mike will organise as much or as little as required, and there is the opportunity to go fishing with one of the under-10m day boats (weather permitting). The trip also involves (if overnight) eating some top notch seafood. Congratulations to the team behind Pintxo in Fowey, who have just opened Pintxo Bath on Barton Street in Bath. This new restaurant features a rather lovely sherry garden too. In Fowey, don’t miss the chance to try the fabulous Manzanilla en rama sherry, which is only produced twice a year, spring and autumn, from Hidalgo in Sanlucar de Barrameda. It’s very special and so delicious, and perfect with a plate of jamón ibérico in the sunshine. 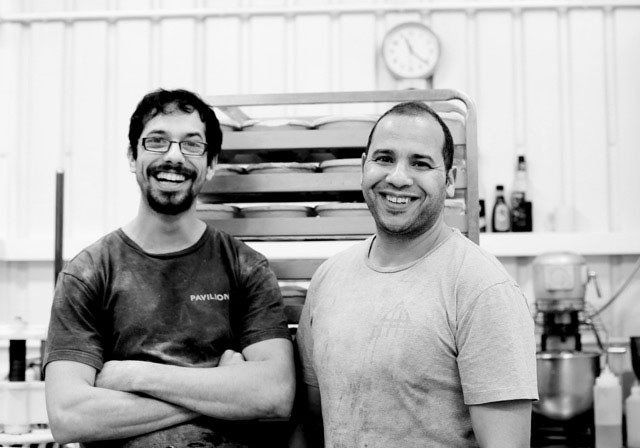 Pavilion Bakery is due to open its fourth store, and first outside London, in Newquay at the end of this month. 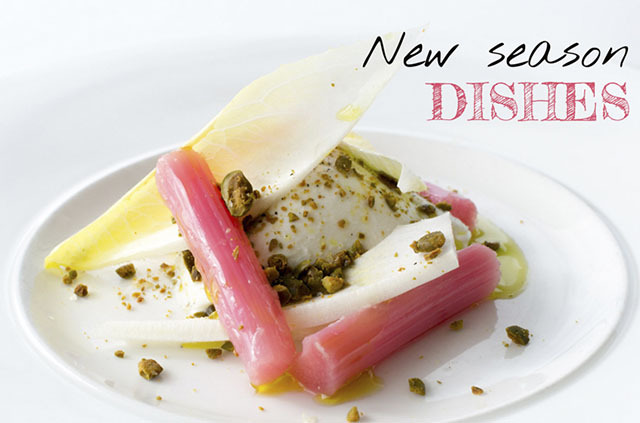 The latest seasonal menus at Fifteen Cornwall are packed with spring colours and flavours. The sample lunch menu includes dishes such as burrata with pickled rhubarb, chicory and pistachio; Cornish hake with herby potatoes and aioli; and crispy hen’s egg with polenta, rocket and Parmesan. Quote SPRING2017 when you book and receive a complimentary dessert (think panna cotta with rhubarb and pine nut crumble, or strawberries with mascarpone and meringue) when you have two courses from the full lunch menu. Available Monday to Sunday until 30 June. Book online or phone 01637 861000. In 2016 Harbour Brewing’s 2/6 project was launched, resulting in two very special beers, a Saison and an IPA, brewed by six breweries – Beavertown Brewery (London), Cloudwater Brewery (Manchester), Harbour Brewing (Cornwall), Siren Craft Brew (Berkshire), The Wild Beer Co (Somerset) and Arbor Brewing (Bristol). This year the project has evolved into something even more special with the 3/9 Project. Nine of the very best breweries from the USA, UK and elsewhere in Europe have been split into three teams who will compete to make three different beers, and they’ll only brew them once. Collaborating breweries are: Adnams, Whiplash, Three Weav3rs, Bevog, Six North, 21st Amendment, Beerbliotek, Breakwater and Harbour. The 3/9 Project will be taking place from 2 to 4 June. Harbour Brewing is offering 25 pairs of tickets to meet the brewers in Polzeath, to watch the beers being made and have a good old-fashioned shindig. There will be free beer and free camping. To be in with a chance of winning, enter here. May’s Wild Wine Club adventure takes place “by the boathouse in a tucked away cove near Padstow” on Saturday 20 May. Guest chef Emily Scott will be joining Adam Banks to serve up a maritime-themed five course feast under the stars on a secluded beach near Harlyn. Mark Hellyar from Chateau Civrac has chosen matching wines and will tell guests about his natural wine making process, as well as sharing some of the history of the bay that has been important to his family for generations. The evening kicks off at 7.30pm with canapés, aperitifs and a paddle, sitting down for starters at 8pm. £60 per person, including five courses of food and wine. Book online. 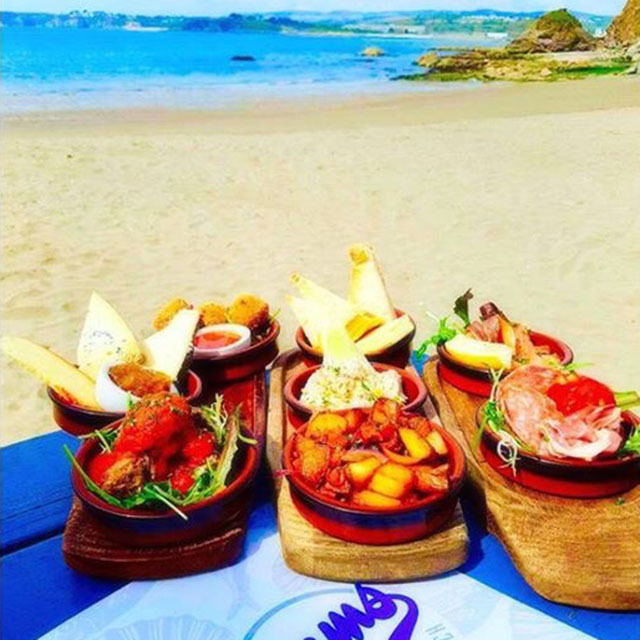 Sam’s on the Beach at Polkerris has a new afternoon tapas menu, served every day from 3 to 5pm on the slipway, on the beach, or inside the restaurant. The dishes look great, including arancini with sweet chilli dip, pork rissoles with aioli, and patatas bravas with chorizo. Priced at £4.95 for one dish, £8.95 for two, or £12.95 for three. Wine pairings are also available. Bookings available for inside tables, phone 01726 812255. The Ship Inn in Wadebridge has signed up for Real Wine Month, a nationwide effort to promote fantastic, sometimes crazy, wines from small, environmentally-sensitive winemakers. The winemaking process is often described as “minimal intervention” so very little is added in terms of chemicals, acids, sulphates. Often they are unfiltered. Rarely are they manipulated by the use of oak, oak chips or oak additives so “real wine” really means “just grapes”. Fermented of course. Real wines don’t taste like regular wines and can be rather surprising, they can be orange and a bit smelly – the marmite of the wine world! If you like them they are a fantastic taste of where wine began and a very strong representation of the elusive term “terroir”. Any wine-loving foodie has a duty to taste them. At The Ship the list will be by the glass and bottle for both lunch and supper. To book a table phone 01208 813845. Taking place on the beautiful Porthminster Beach over the weekend of 13 and 14 May, this year’s festival promises a wide array of culinary experts, attractions and local food and drink producers. Demo chefs include Nathan Outlaw, Jack Stein, Sophie Michell, Gizzi Erskine, José Pizarro and Mitch Tonks. In the week leading up to the festival there will be a Food Trail around the town, with discounts and tasters to be found at various shops and businesses. For full details visit stivesfoodanddrinkfestival.co.uk. Enjoy a three course set lunch for £40 at Rick Stein’s The Seafood Restaurant. The spring menu includes freshly landed fish, locally sourced vegetables and dishes inspired by Rick’s latest travels around the world. Dishes include Cornish rump of lamb with wild garlic, fillet of pollack with clams, asparagus, peas and parsley and panna cotta with stewed forced rhubarb. For sample menu and reservations visit website. Photo by Chetwode Ram Associates. 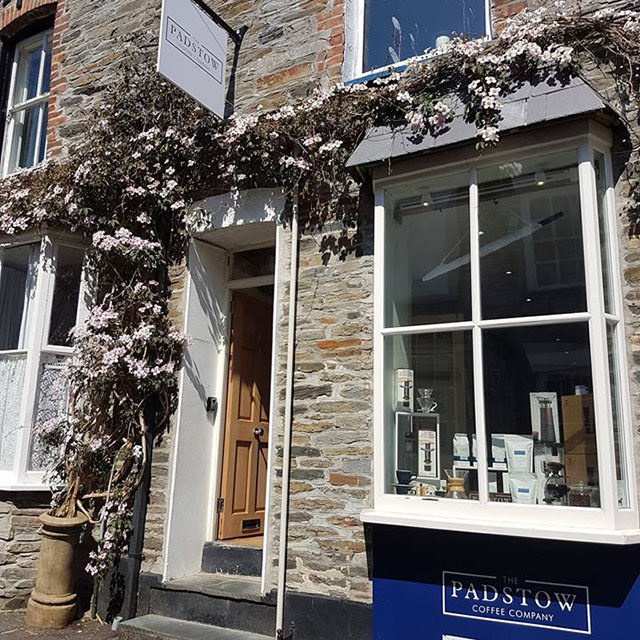 The Padstow Coffee Company has opened its first retail store at 18 Duke Street in Padstow, combining a shop and tasting room. The company has a passion for the finest luxury coffee, buying ethically sourced beans from around the world, working closely with farmers and co-operatives to create the perfect blend. As well as selling their own coffee, the shop has an extensive range of high quality coffee brewing equipment and barista accessories for both home and trade use. There are coffee tastings and demonstrations throughout the day. The team is also very excited to be one of the first places in Cornwall where you can try and buy nitro coffee. This is cold brew coffee with added nitrogen gas, which turns it into a Guinness type consistency, apparently a really refreshing way to drink coffee! Philleigh Way Cookery School has launched a new desserts cookery course. During this hands-on one day course you can learn to make a wide range of show-stoppers. Sample dishes include a kaffir lime and chocolate tart, strawberry and white chocolate mousse, dark chocolate collar and caramelised rum banana. £150 per person, including refreshments and lunch. The Weber BBQ courses kick off again this month and first up, is Weber Essentials on 24 May, teaching students how to use Weber’s renowned “lid-on” barbecue technique to grill, roast, smoke and bake. Following in June are the BBQ Classics and American BBQ courses with Seafood Essentials coming up in July. £99 per person. 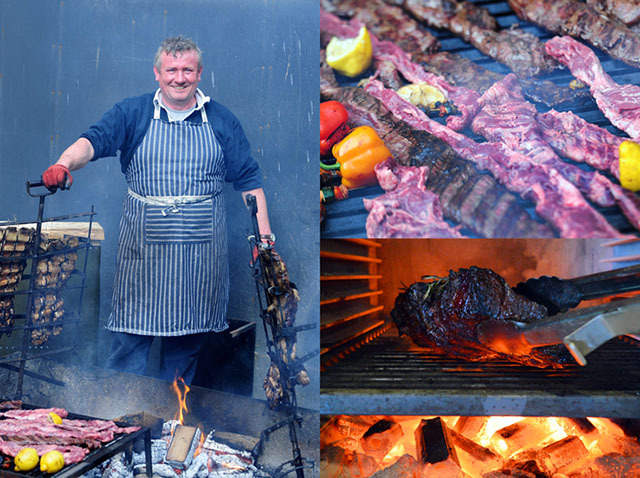 Another great course ahead of summer is the Argentinian Asado course – all about fire and meat! The antithesis of North American BBQ, asado is all about letting the flavour of the meat speak for itself. No spices, rubs or marinades are added before the meat is touched by the heat of the fire. Very slow cooking over hardwood embers creates smokey, succulent and flavoursome meat. Students will learn the correct principles of fire building, management, temperature control and charcoal making. £150 per person. 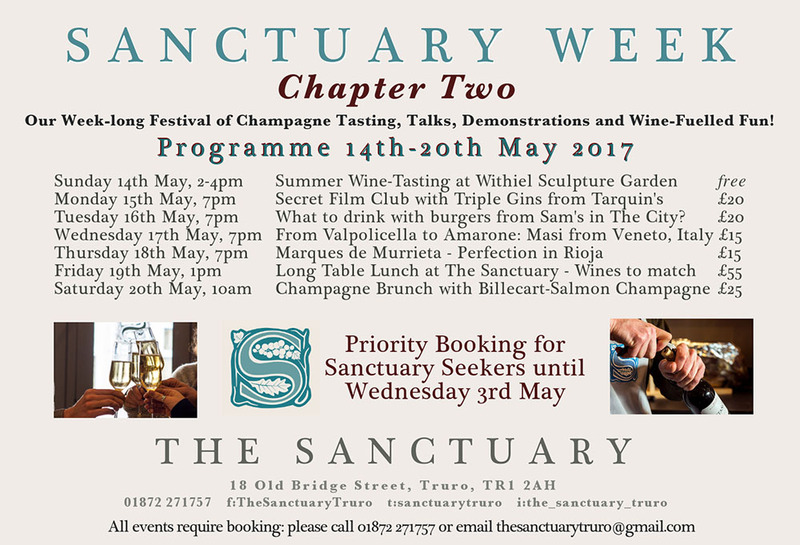 Truro wine specialist The Sanctuary is holding a week-long celebration of wine, from 14 to 20 May. The week kicks off with a wine tasting in Withiel Sculpture Garden, followed by tastings, films and meals back at the Truro HQ each day. Full details are shown in the timetable above, or visit Facebook for more information. 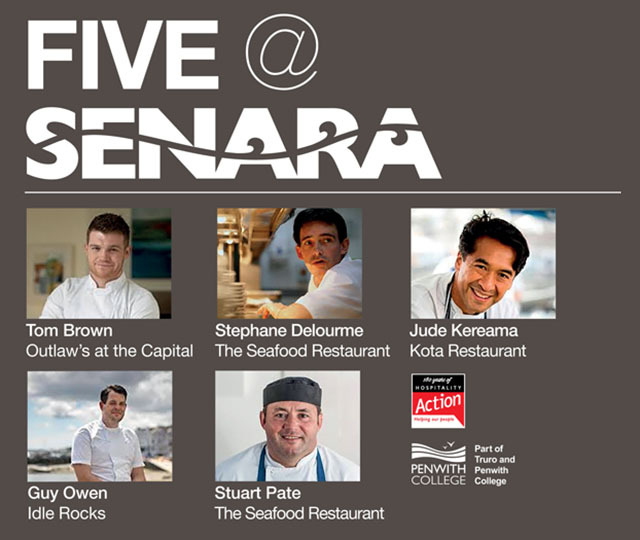 Restaurants and suppliers to the hospitality industry are teaming up with five of Cornwall’s top chefs and Senara Restaurant at Penwith College for a charity dinner on Friday 30 June, with all profits to be donated to Hospitality Action. The five chefs, who will each be cooking a course, are Tom Brown (Outlaw’s), Stephane Delourme (The Seafood), Jude Kereama (Kota), Guy Owen (The Idle Rocks) and Stuart Pate (The Seafood). John Keast (Scarlet Wines) has chosen a matching wine flight. As well as providing guests with a fantastic meal, the evening is a huge opportunity for the college’s hospitality students, who will be working alongside the chefs and running front of house. Tickets are priced at £70 per person, with wine flight for an additional £25. To view the menu, and for full details, and how to book, visit website. 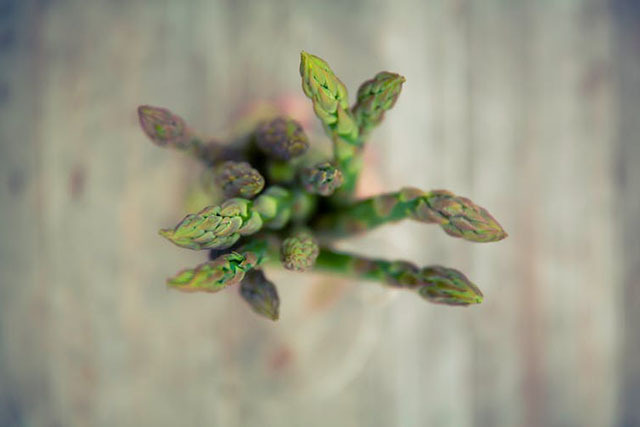 Surfside’s head chef Andi Tuck has put together a delicious sounding menu to celebrate asparagus season. Surfside in Polzeath is less than a mile from the farm where St Enodoc asparagus is grown. The menu includes Cornish coppa and black garlic mayo, turbot and pickled rhubarb, pollock with Doom Bar and mussel sauce and rum panna cotta with caramelised asparagus. 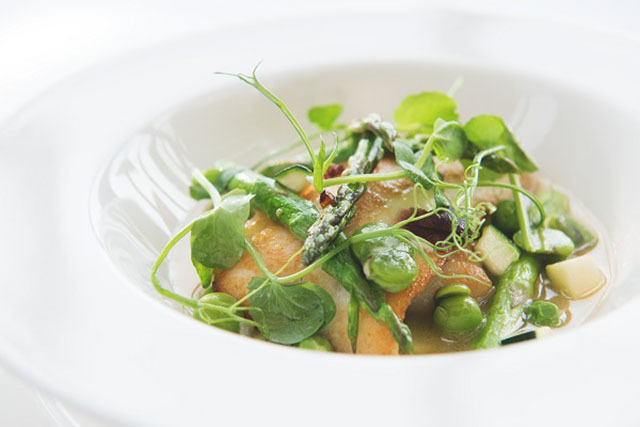 Priced at £35pp, the menu is being served until 28 May. For more details visit surfsidepolzeath.com. Lady Daphne Pentire has been conned into selling her land at Pentire Head to a developer who is building a Roald Dahl theme park. The plot thickens and murder ensues… £32pp, full details online. Wild Bake will be popping up at binTwo at Hawskfield between 5 and 8pm. Pop in for pizza and wine, or grab some to takeaway. An Asian-inspired pop up banquet by Bango Kitchen at Espressini in Falmouth. £30 pp. BYO bottle. Charles Wharton from Ellis Wharton Wines will be leading a ‘Vintners Tour’ of France at La Cave in Falmouth, with matching fromage and charcuterie. £37pp, to book phone 01326 617510. Woodfired Canteen is joining forces with The Cornish Food Box, cooking up a menu of nibbles, main and pudding, all with a twist towards their vegetable of the moment, starting with beetroot. £35pp, book online. The Hidden Hut’s first May feast features a Porthcurnick fish pie – chunky white fish cooked in a tarragon and samphire cream sauce, topped with cheddar mashed potato, and served with buttered spring greens, peas and charred leeks. £14 pp. From 7.30pm on Friday 12 May, in aid of St Minver Pre-School. £15 (canapés and a cocktail included). 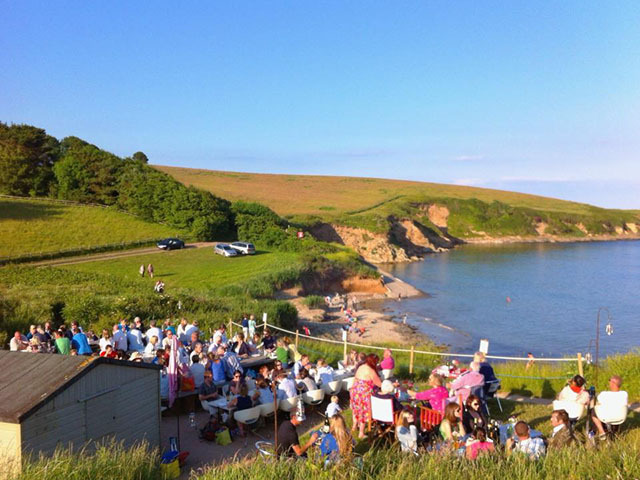 Porthminster Beach Café is hosting a Festival Dinner as part of the St Ives Food and Drink Festival. 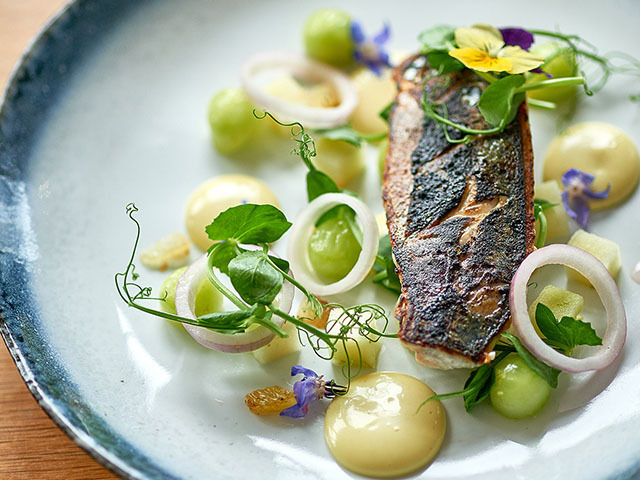 Dishes by Mitch Tonks, Jack Stein, José Pizarro, Gizzi Erskine and Sophie Michell. £60pp, but already sold out. Woodfired Canteen is decamping to Windout Farm, where they’ll be joined by Gill Meller for a fabulous afternoon-long wood-fired feast. £30 adults/£15 children. A delicious-sounding five course Greek feast, with matching wines by Eclectic Wines, at The Old Coastguard, see menu, £60pp. Join Naoko’s Kitchen and binTwo at The Arc at Hawksfield for a lesson in sushi-rolling and sake drinking. £60pp. The menu for this feast sounds mouthwateringly good – lemon, oregano and paprika spit-roast chicken, served with chips crisped up in the roasting juices, salad and aioli. The Fox’s Revenge is hosting a two-day festival of food, music and craft beers, ales and ciders. £10 for the weekend. Camping available. Book online. Learn to make espresso martinis with experts from Chase Vodka, Origin Coffee and the Fifteen Cornwall bar team. £35pp, includes antipasti. Book online. Join Naoko for a lesson in sushi making, £16pp, at Penair School in Truro. 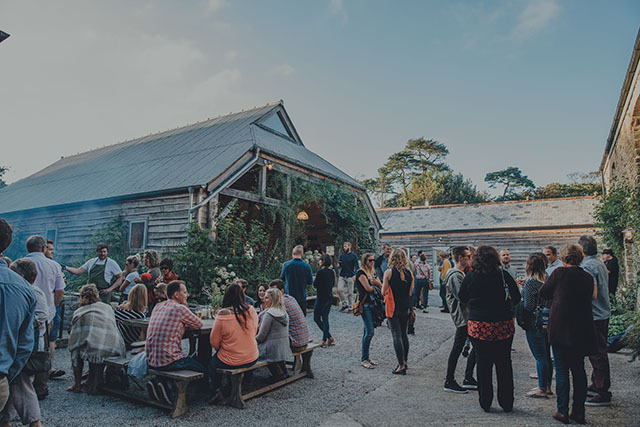 This little food and drink festival is hosted by The Old Mill House, and features a small, but perfectly formed, selection of food producers, street food stalls and chefs. 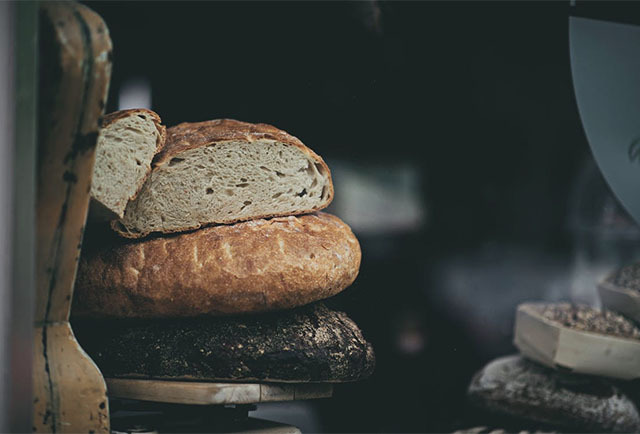 The new bakery at Coombeshead Farm is due to open this May, led by Ben Glazer, who’s running a new bread workshop, suitable for all abilities. 11am to 5pm, £100pp, lunch included. Enjoy a Moroccan date and chick pea tagine at St Kitts Herbery for just £5pp. Drinks and desserts charged separately. Details online. This bank holiday feast features Cornish monkfish cooked in a Sri Lankan masala of coconut, kaffir lime leaf, ground spices, ginger & chilli. Served with crispy Curgurrell crab fritters, green beans, baked rice pilaf and flatbread. A grand tour and wine tasting at Camel Valley, plus a feast of bruschetta, pizza and dessert from Wild Bake. 6pm – 9.30pm, £30pp, buy online. At 12 noon on 1 June tickets go on sale for the June feasts. A masterclass in sparkling wine, including tour and tutored tasting of six sparkling wines. £20pp. Book online. 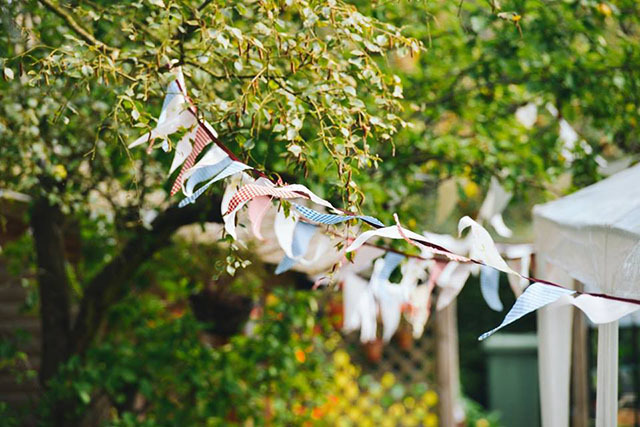 See greatestatefestival.co.uk for full details of this “rambunctious garden fête”. Mission Wines’ first wine tasting at The Ship Inn in Wadebridge. £12pp to include cheese and charcuterie. Email [email protected] to be added to the mailing list. For a full programme of this year’s event visit royalcornwallshow.org. 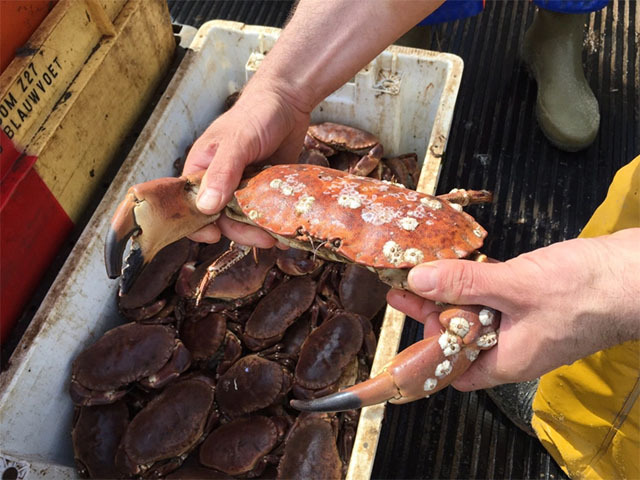 The first of the Gurnard’s Head new pop-up dining events will be Crab on the Moors, featuring crab dishes, oysters, mussels, and more. Keep an eye on Facebook for details. Join the binTwo team at Padstow Kitchen Garden for a wine-fuelled feast. £55 per person. Congratulations to Adam Banks, newly appointed head chef at Fifteen Cornwall. Adam previously worked as senior sous chef at Fifteen for five years, before a stint in Australia, and then at The Star and Garter in Falmouth. Rick Stein, Fistral has a new bar, with views overlooking the beach. It’s the ideal spot for enjoying a cocktail whilst watching the sun set. Nathan Outlaw’s fourth book is now out. Home Kitchen features over 100 recipes, ideal for a busy home cook. Available from all good bookshops, or order direct from the man himself via outlaws.co.uk/shop. Fish-lovers should head to The Fish House at Fistral this month, where chef Paul Harwood is serving up delicious whole roasted turbot with asparagus, priced at £50 for two people to share. Da Bara Bakery Café is opening until 9pm every Wednesday, with hot food specials each week. Bikes are welcome; the café is right on the roadside on the main drag to St Mawes. Ben Tunnicliffe has opened The Surf Den at Sennen, alongside the launch of an exclusive ale “Head Launcher” produced for the restaurant by Skinner’s Brewery. The Surf Den is an outside bar offering drinks, chilled DJ sets and freshly baked pizzas. A new Farmers’ Market is coming to Mawnan Smith. The first market will be held between in the Memorial Hall between 9am and 3pm on Saturday 27 May. From 14 May the Old Bar at St Tudy Inn will be open on Sunday evenings too. Hooray! The Arc Food Store at Hawksfield is now operated by binTwo, alongside their wine business. Customers will soon be able to purchase deli tasting boards to enjoy on the premises, plus tasters of wines, sherries and spirits to match. Good luck to Nick Hemming who, after five years as Head of Food at St Austell Brewery, is moving on to join his wife at their family business, The Heron Inn in Malpas. New restaurant Loveday’s in Charlestown has recently opened, serving food all day and on Thursday, Friday and Saturday evenings. The menus look great and we look forward to trying it out. Chef Adrian Oliver is to head up the kitchen at Trevisker Garden Centre‘s new eatery. There’s a new street food truck on the circuit: El Huichol is an authentic Mexican food vendor. Check out Facebook for more details and menus. We’ve heard a rumour that Gilmore’s is expanding, with a second restaurant opening in St Ives soon. Captain Hanks Fresh Fish & Grill will soon be open in Fowey, the brainchild of Fowey Sea Farms’ owner Sue Hancock. Captain Hanks will be serving the freshest of fish dishes and there’ll be a wet fish counter for those who want to cook at home. Town House Pizza in Perranporth is now open, with Stephen Marsh at the helm. Espressini in Falmouth has launched a Crowdfunder campaign to raise funds for a series of special events, including learning clubs, one-to-one espresso tuition and pre-booked group sessions of brewing and cupping coffee. Curds & Croust has just celebrated its first birthday with some great news: their cheeses Miss Wenna and The Truffler have both won bronze awards in the prestigious Artisan Cheese Awards. The Natural Store in Falmouth has just opened a new vegetarian café, open Monday to Saturday from 9am to 5pm. We love to hear from you. As ever please get in touch via the comments section below, or send us an email. You can also follow us on Twitter. If you have food news for the June Foodie Diary please email it to reach us by 23 May.